Location: Clough, County Down, Northern Ireland. Built: 12th or early 13th century. 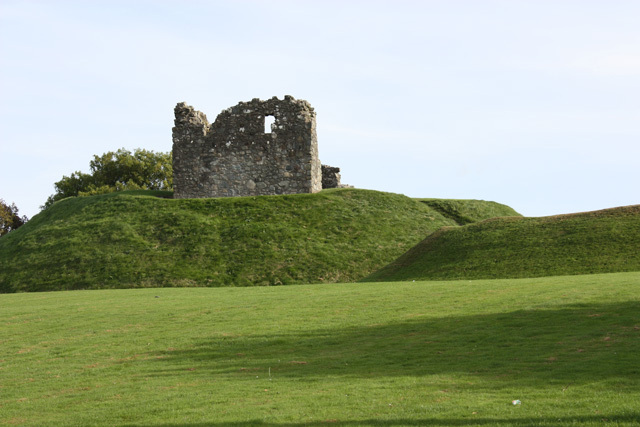 Notes: Clough Castle is the site of an Anglo-Norman Motte-and-bailey situated in Clough, County Down, Northern Ireland, near the junction of the A25 and A24 roads. Clough Castle Motte and bailey and tower are State Care Historic Monuments in the townland of Clough, in Down District Council area, at grid ref: J4092 4029. It is an excellent example of an Anglo-Norman castle with an added stone tower. A small kidney-shaped bailey lies south of a large mound, originally separated from it by a 2.1m deep ditch. On top of the 25 ft high motte is a stone tower, enlarged to become a tower house in the 15th century. It is sited off-centre as much of the rest of the top of the motte was occupied by a large hall, which apparently burned down. Around the motte is a ditch, and on the south-east side a low crescent shaped bailey, which was probably once joined to the motte by a wooden bridge.